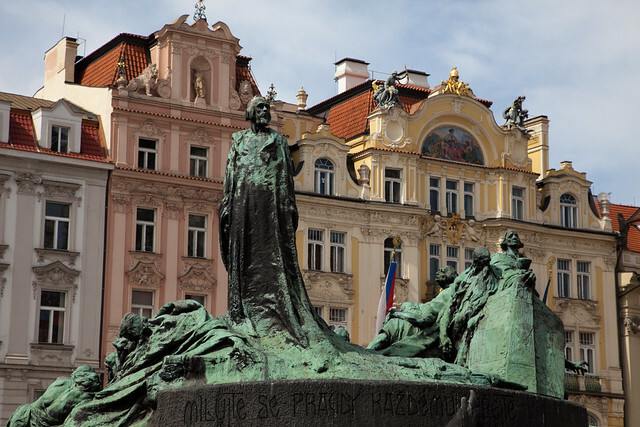 Today is Jan Hus (John Huss) day in Czech Republic. On July 6, 1415, Jan Hus was martyred for his faith in Christ in the city of Prague. He was a man who believed what God’s Word says and was willing to put his own life down for the cause of Christ. Considered a pre-Reformer-Reformer, he influenced Martin Luther who eventually started and led the Reformation 100 years later. It is men like Jan Hus who inspire Christians and missionaries, especially me. It could be said that he did more in his death than in his life, though his life was full of courage, conviction, and care for the cause of Christ. I feel honored and proud to stand on the shoulders of Jan Hus and carry on the work that he paid the ultimate price for. What an example of Christ-likeness we see in Jan Hus who was willing to lay down his own life, just like the Savior he loved. I do not know how many Czechs will stop and consider today the great sacrifice this man made, but I can only pray that God would spark another spiritual fire in this country with men and women like Hus. May the gospel of Christ be carried to each and every soul in this country and would that many would turn to Christ and be willing to sacrifice everything for Him. And maybe one day, if it be the will of Christ that we too should suffer, that we too will pray “Lord Jesus Christ, I will bear patiently and humbly this horrible and shameful and cruel death for the sake of Thy Gospel and the preaching of Thy word.” – Jan Hus, July 6 1415, shortly before being burned at the stake for his faith.